Dr. Welsh spoke to the Rotary Club of the Stroudsburgs about the future of ESU in the community. 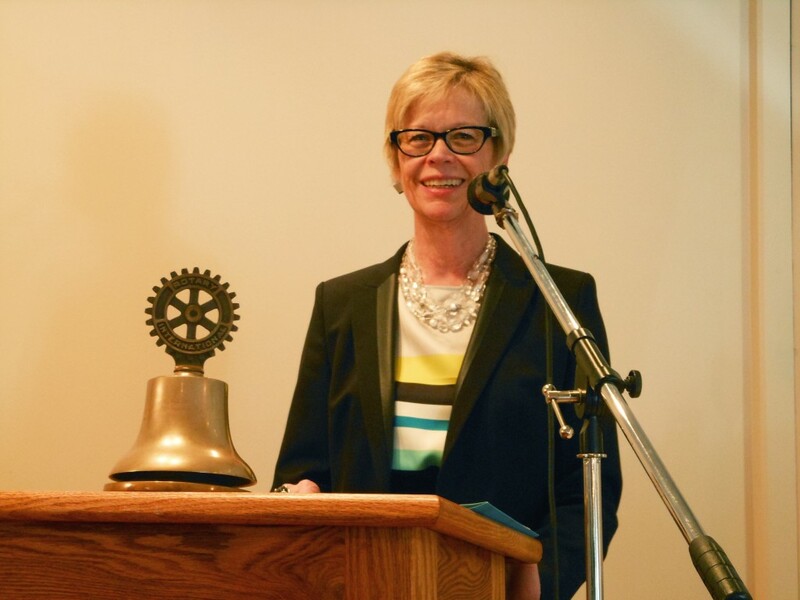 President Marcia G. Welsh of East Stroudsburg University spoke to the Rotary Club of the Stroudsburgs at their weekly meeting last Thursday, February 14. “I’m proud of our students,” said Welsh. She spoke about two successful ESU affiliated students, Jonathan Weber, a student currently in his junior year, and ESU graduate, Melissa Shaw. Weber was the winner of the PASSHE Business Plan Competition in 2011, and is the founder of Marathon Studios Enterprises. Shaw conducted collaborative research at ESU, which culminated in the creation of Lyme-Aid, a home testing kit for Lyme disease. Both of these students are still active at ESU, and can be found at the new Innovation Center on the edge of campus. According to Welsh, students at ESU likewise strive in areas outside of research and enterprise. As an educator, Welsh spoke on academics as well. “We are one of only two PASSHE universities to offer a Chinese minor,” Welsh said with elevated enthusiasm. Despite all the positive elements of the University, however, there are some aspects of ESU that Welsh would like to improve. “I think we need to do much more in the arts. We have a jazz minor that is not thriving,” said Welsh. Contrary to the University, the Rotary of the Stroudsburgs has a long, artistic tradition, as evidenced by The Sherman Theater and its various other influences. Welsh made more sense of the discontinuity between the school and the community. Rotarians know this better than anyone. Rotary is, after all, a service organization mainly focused around camaraderie and grassroots efforts. The Rotary Club of the Stroudsburgs recently donated their Seventh patient transport van to the Monroe Unit of the American Cancer Society. On a more global scale, Rotary works to eradicate polio, a devastating disease with a relatively low-cost cure. They have already donated billions of dollars to this effort. These efforts require participation, and college students sometimes have trouble getting involved. Fortunately, the Rotary Club of the Stroudsburgs is currently working to break down the barrier between the town and ESU by establishing a Rotaract Club as a recognized organization on the ESU campus. Rotaract is an extension of Rotary meant for those between ages 18 and 30. The Rotaract Club of East Stroudsburg University is currently undergoing Student Senate approval, and could be a university recognized club as early as later this Thursday afternoon. As President of Rotaract, I plan to coordinate productive and meaningful projects and events on campus, and would like to get as many people involved as are willing to try to make a difference. “This is something we need,” said Welsh, while speaking of relations between the town and university. If you would like to know more about the Rotaract Club of ESU, contact esurotaract@yahoo.com.